Renowned for warm hospitality, lip-smacking cuisine and sincere services, Vision Hotel Apartments features roomy and well-appointed hotel apartments suitable for the discerning leisure or business traveller. 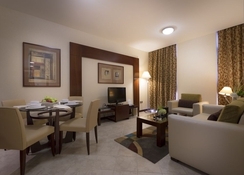 It is only a few minutes away from the tourist attractions, nightlife and shopping. 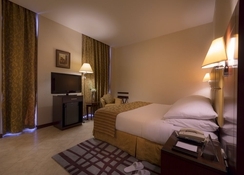 This ultimately makes it the perfect place to stay for discovering the spectacular city Abu Dhabi. All that you have to do is step into this contemporary hotel and uncover a new perception on all-suite extravagance. With one restaurant, 18 executive suites, 71 junior suites, 36 studio suites and wide-ranging leisure and business facilities, this hotel has become the first choice for all types of travellers. Children too are welcome in this hotel with babysitting and childcare facilities. Vision Hotel Apartments is only 15 minutes’ walk from the nearest beach. As the hotel is centrally located in the city, you can enjoy marvellous views from the rooftop pool. The Abu Dhabi International Airport is about 37km from the hotel and the Abu Dhabi Mall, Yas Mall and AL Wahada Mall are just minutes’ drive away from the hotel, making it convenient for your shopping needs. The sea-front boulevard in Abu Dhabi is just a 7-minute walk and the Port Zayed is about a 10-minute drive. 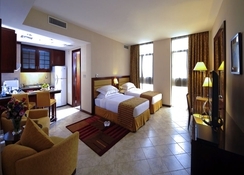 The hotel comprises of 125 suites, which are categorized as 36 studio suites, 71 junior suites and 18 executive suites. All the rooms have contemporary and stylish interiors and have all the necessary amenities like flat-screen TV, dining and seating areas, marble bathroom, free Wi-Fi, air conditioning, coffee/tea maker, phone, fridge, microwave, hairdryer, in-room safe, 24-hour room service and much more. The restaurant in Vision Hotel Apartments offers gourmet dishes from exotic Asian fusion cuisine to conventional specialties. The hotel has hired one of best chefs who prepare the best Arabian cuisine using the finest ingredients. The staff members have a friendly and professional approach towards the guests and will give suggestions to choose the best food combinations. There are abundant sports and leisure facilities in the hotel that will excite all kinds of travellers. There is a roof-top swimming pool, where the guests can go for a swim and at the same time enjoy the stunning views of the Abu Dhabi city. Guests can stay in shape with the latest cardiovascular equipment’s and weights at Vision Hotel Apartments' fitness centre.